As I was walking in our front yard to take out the trash I heard the faint cry of birds chirping. Not the type of chirping that would drive you crazy enough to keep a loaded bb gun next to the door, but more like the chirping of finches. They seemed far away, but the chirping was crystal clear. I walked around the closest bush with hopes to maybe see this nest of baby birds up in our neighbors gutters, but as I moved, the sound moved. My depth of hearing was off. The chirping actually came from within the bush right next to me, which would explain the clarity of the chirps. I moved around the entire bush to hopefully get a glimpse of these tiny little guys, but alas the nest was a little too high. I could see the bottom of the nest, but through the branches and leaves it was nothing more than a black ball of sticks. So I brought out the ladder. By this time the kids heard all the ruckus, but didn’t hear me say anything so they knew I was up to something and they came outside. When I placed the ladder next to the bush, they immediately knew I what I was trying to find. They’re pretty smart like that. 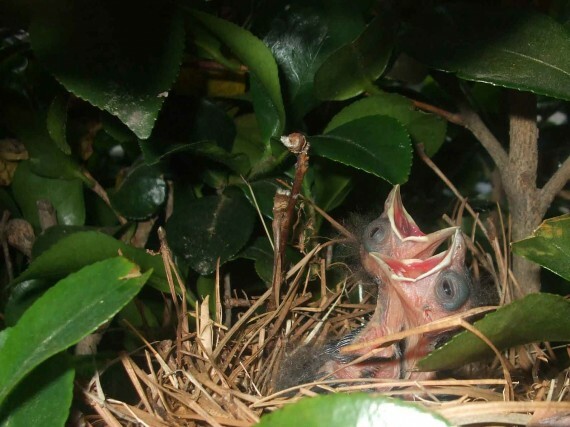 These birds heard the rustling of the branches, and immediately thought their parents were coming to feed them. About this time I could see the mother and father bird flying around us, and I was just waiting for one of them to swoop down and gouge my eye with their gnarly beak. So I took the ladder down and we went inside cause it was our dinner time and we were hungry. No moral to this story, just an awesome time discovering and enjoying our Creator and one of His creations in our own front yard, and letting our children capture it to remember forever. When’s the last time you discovered something? Ben, if only my most recent discovery was as cheerful as yours. I discovered a water leak in my basement. Not happy news. At least it didn’t involve the possibility of painful eye-gouging at the beak of parental birds. Oh man, I kind of despise basements, especially below-ground level ones. Oooo…so cute! What a treasure! I am with Donald on this one. I discovered that after we saved for a while for a new battery for our truck, it was the alternator. 400 dollars for a garage to do it, 30 minutes and 130 for me to do it. I too hate finding new things in regards to cars… unless it’s new and has tons of secret compartments and gadgets. Before or after it was embedded within your fingernail? I discovered ants in my home. Little boogers are hard to get rid of. I also discovered that Ben likes to climb ladders to disrupt the lunch of baby birds. We are kinda fond of birds at our house. Allison has turned our postage size backyard into a bird chapel (not big enough to be a bird sanctuary). We are constantly amazed at the variety of birds that show up to eat, play in the bird bath or just hang out on the fence. So many different sizes, so many different colors, so many different voices and songs. Oh man, all those birds would drive me crazy! Well, unless it was sound-proof inside, and poop-on-the-window proof. Ben-always loved animals. The flying squirrel, turtles – boxed, red-haired sliders, snapping, etc. and remember the iguana…? Oh, the frogs? and the little mice? you raised them so you could take them to the pet store to feed the snakes? uhmmmm, lets see…and the trip from Santa Barbara to Sunnyvale and you had your sister take them in her car for you…the only thing….the mice multiplied from 10 to 20? LOL so refreshing to see you still have that love of life in you. BTW, Awesome picture Kiersten! I like to think that we discover new things everyday as we go about life. I’m leaving this comment, just because. I honestly can’t tell if this is spam or not… anybody else have any opinions? Gabriella seems to be making the rounds on some of our blogs lately. I think she’s a clever hybrid. I figure we should let her stay if she can reply with a good elephant joke. A few days ago my family and I drove from Nashville to Tupelo along the Natchez Trace for the first time. We saw a deer, a gopher at least a dozen wild turkeys. It’s always neat seeing wild animals up close. I like to imagine that when I drive by herds of cows and yell, “Mooooo!” out the window, that the cows wait until I pass and then stand up and quote Shakespeare. I discovered a bird’s next in my mailbox whenever I opened it and a bird flew out. I only screamed a little. I bet even your scream had a southern accent. You got a better shot than I did – I was so afraid that mama bird would give them up if I got too close. I’m interested to get photos as they grow. What a gift. Ha! That’s exactly what I was thinking, man these birds are ugly, but look they want to be fed. Cute. I can’t take the credit for the photo, I can only take credit for holding my 10 year old daughter in place while SHE took the shot.